You may know that over the years I have had a number of memorable encounters with hawks. In fact, I like to think of the hawk as my Spirit Animal. Well, I had not encountered any hawks close up for a couple of years, until the night before my latest Small Contemplative Group Meeting. I was waiting for the bus when I noticed this hawk sitting about twenty feet up in a nearby tree. Suddenly it dropped out of the tree and swooped into a nearby bush, scattering a number of little sparrows. I didn't see it for quite awhile, so I assumed it had been successful and enjoying its meal. Eventually it did come out and flew off down the road. I posted this on Facebook and my friend Keith said it sounded like it was a Cooper's Hawk. I looked the Cooper's Hawk up on Wikipedia, and learned that this diving into brambles or bushes to seize prey was the typical hunting procedure for this bird, but this is also dangerous for the hawk, leading to broken bones and even death as it plunges through branches and by the trunks of plants. It made me think of God sending an angel to the first Cooper's Hawk, saying, "Fear not! I have wonderful news, God has designed you for this type of hunting, where you plunge into bushes and brambles to catch tasty prey!" To which the Hawk replies, "Really? Is this a good idea? Wouldn't I be better off flying up high and diving down on mice in the wide open prairie? Or how about flying very fast and catching other birds in flight? Do I really have to fly into bushes and brambles?" And the angel says, "God loves you, and has made you this way so that this type of hunting is best for you. I think you'll find that the tastiest prey hides in bushes, and you will be the only bird able to catch and eat them!" 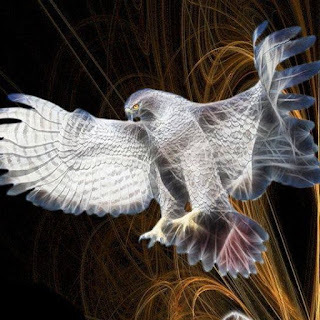 So the Hawk shrugs and says, "I believe God loves me. Her will be done!" The End. So the day after my hawk encounter, I had the most memorable and perhaps life-defining time of the Program at our Small Group Meeting. All along I have found the Program inspiring and moving, but I have had doubts from the beginning. Do I really belong here? Do I have the ability to be a Contemplative? Will this really change my life? Or six months after the program finishes, will I have forgotten all about the practices I have been taught and planned on using. Will life become a blah, day by day drudgery? 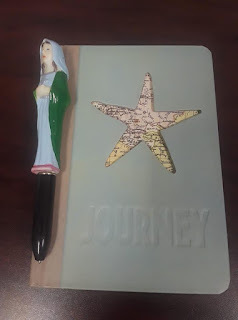 As we were each discussing our feelings since the last retreat, I was once again inspired by the words of my fellow pilgrims, admiring their insight and their ever-growing commitment to the Contemplative life. As I waited for my turn to speak, I thought of the various happenings in my life over the past month and tried to think of what was most relevant. I finally chose the story of my baking a pie for the mission candidates at Maryknoll: how I found myself thinking of each candidate, trying to see their faces in my mind, and how I prayed for each of them as I gathered together the dough, sliced the apples, rolled out the dough, and laid each piece of apple, one by one, within the pie shell. I then put the pie in the oven, and the smell of apples and cinnamon filled the apartment, reminding me of the process and for whom I was baking the pie. As I told the candidates, the pie probably didn't taste any better, but it made the whole process more sacred for me. So after everyone had told their stories, and we had shared what resonated with us about each other's stories, Janet, the facilitator brought the gathering to a close. She talked about how she could tell that we were all making excellent progress, each in our own way, and how God had been calling us to this, all our lives, from birth until now. And you know, for the first time I thought, "I believe it. This is real!" I felt a rush of excitement (and still feel it now). I think I have fully accepted that this is really God's call for me. So God sends me the Hawk, who tells me, "Do not be afraid, for I have wonderful news. God has chosen you to be a Contemplative and has provided you with the tools you will need to make the final transition." And I respond, "Really? Now that I'm 66 years old? Couldn't God have prepared me for this years ago? Say when I graduated college, so I could have a full life of being a Contemplative?" And the Hawk says, "No. You can't just become a Contemplative. You have to live and learn until you're ready. It takes many years of life and experience before you can truly been a Contemplative." "But did I really need to go through all that misery, and all those years of being an atheist, wandering in the wilderness? What good did that do me?" 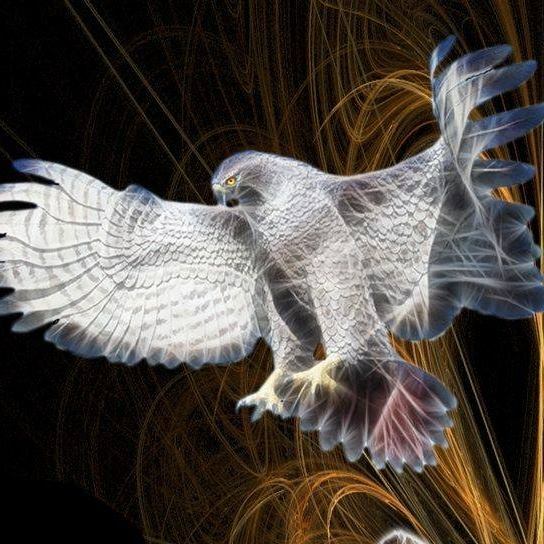 The Hawk says, "I know it was hard for you, but now you will be fulfilled and you will be able to help so many other people. God loves you, has loved you, and will love you forever. Now you have your reward." And I say, "I believe God loves me. Her will be done."